Sign up to receive news and exciting updates. As we prepare to say goodbye to our Overland Park house and hello to a new adventure, I wanted to take some time to reflect on how far this humble ranch has come. We knew with our little ones getting bigger, school districts were about to become a very important part of our lives. As anyone in this area will tell you, the Kansas City school district is...interesting, and we knew that our Hyde Park home was not going to be the place we were able to stay forever. 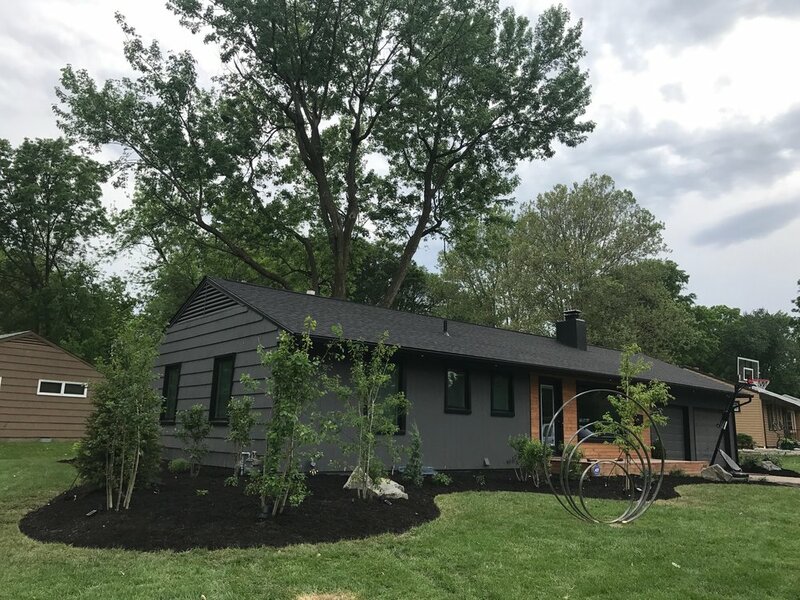 We looked to Overland Park to make sure we got a jump on a great kindergarten for bud, and to find a house that we could really inject with our style. Our main goal in looking for a new home was to find the most boring house in a good neighborhood. We wanted something that was not so nice that we would be in a bidding war with other families, but not so trashed that investors would have jumped on it. With the rise in popularity of house-flip shows, properties in desirable neighborhoods are getting snatched up left and right and getting ‘flipped’. Word to the wise, be very careful looking at ‘flipped’ homes, as the goal is to make as much money as possible and sometimes that can mean cutting major corners to get a home aesthetically ready to get on the market! So, with that in mind, we wanted something that wasn’t ‘done’, as we have all the capacity to do that work ourselves, and make sure it’s done 110% right. Its not SO bad, but of course nothing we wanted. After some landscaping, windows, new roof and gutters, new deck and some paint! Kevin, very worn out from doing all the work. Isn't the decorating amazing?! The Walmer house had sat on the market for 65 days and hit all our criteria. Sturdy, clean, ugly, and did I mention ugly? Guys, it was so bad. The only things we liked about it were the price, lot size, and school district. That was IT. Floral wallpaper, closed off kitchen, a fireplace that hadn’t been touched since 1986. I can honestly say there was not one thing about this house I was hesitant to change. We were able to get it for a steal, and then the fun part started. Well, fun for me in that I watched all these amazing changes happen, may have been a bit more stressful for Kevin. Yes, that is the same fireplace! Our first move was to take out the two walls that closed off the kitchen from the rest of the living space, lace in and refinish the hardwood floors, and vault the ceilings. Opening up the ceilings was an incredible breath of fresh air, and really took the space from just another ranch in the ‘burbs to a different level of style. Over the next while, we were able to save up what we needed to update all the subsystems, which I think would probably count as some of Kevin’s favorite features of this house, while mine would be the blue steel fireplace and the custom concrete waterfall table/island. Actually, when that piece was being installed, it was dropped on the steps leading up to the house, which is funny now but was decidedly not funny when it happened. I really hated this bathroom, the wood wall all warped, the faucet didn't work and it just looked dirty. I don't have a before of this bathroom, but it wasn't good. We laid out the bathroom different, moving the shower the make it larger. There are so many things I’m going to miss about this house, but looking ahead to the next is always fun to imagine. Our wishlist for the next house would include a mudroom, and an office for all of our Brasstacks business. Running your business on the same space that you prepare your meals isn’t what we’d call ideal, and we are very much so looking forward to having designated workspace in our next home. But, we will always carry such fond memories of this house, and are so thankful it is going to be enjoyed as the gem it is for decades to come. While it can be really easy to get sucked up in scrolling through your phone or browsing on your computer, there is something very awakening about picking up an actual book when your well of inspiration has run dry. Below are a few of my favorite titles to turn to when I find myself blinded by the blue light and in need of some tangible images under my fingers. This book is one of my favorites and if you are looking for recipes, ideas on being a business owner, or just general everyday inspiration, Kinfolk has a publication to cover you! To start, a quintessential style icon, The Kinfolk Home. As the title (“Interiors for slow living”) would suggest the volume is full of fantastically sparse spaces. Sparse does not stand for plain in any sense, however. Throughout this book, you are taken to homes all over the world and see how many ways a home can be created through thoughtful gestures. I tend to stray from ‘trends’ and focus solely on creative features that will stand the test of time. This book always encourages me to approach any design with careful intention, and to make sure that the accents I choose will serve the space well, under any circumstance and in any decade. I love when Old meets New and Sibella Court does it so well, this is just one of her many books! Up next is another super fun volume called Etcetera, by Sibella Court. If Kinfolk is a practical older sister, obsessed with keeping things neat and tidy, Etcetera is the kaleidoscopic younger sibling, doling out color and sometimes even glitter over the eldest’s white linen. Etc. is all about using things in unexpected ways, taking small items and using them as focal points, and how using colors appropriately can be the greatest thing in the world. Sibella encourages readers to re-think household items, stating that a chair can be a table, the floor can be a bookcase, and a photograph from vacation can be your room’s next color story. I think the biggest underlying theme of this book is passion, and how your love for life can so easily transform your space from timeless but lifeless to purely you in every possible sense. If you want a bit more international influence in your home, look no further than the French publication MiLK. MiLK is an amazing resource for incredibly different and equally incredible spaces all around the world. Trust me, you do not need to fluent in French to appreciate every stunning image in this publication (although, sure, if you’re fancy and bilingual go ahead and translate while you look). This issue takes you through homes all over the world, from native France to a stunning apartment in Brooklyn that will leave you wondering why you don’t have yellow velvet couches and a window/wall in your bedroom that opens to the roof. Sometimes language isn’t necessary to understand when something is just beautiful and this is totally one of those times. Images are all you need. What are some books that have sparked your interior dreams? List them below so I can check them out!